Netgear 4G mobile routers are very well-known worldwide due to the stable performance and practical functions, and it’s always leading the development direction of the 4G LTE mobile broadband. If you know the Netgear Aircard 790s, you may know it’s the world’s first LTE mobile hotspot with a touchscreen. Now the upgraded model Aircard 810s becomes the best seller for LTE-A networks. As the aggressive competitor, Huawei follows the steps of Netgear. Huawei released its first LTE mobile router with a touchscreen: Huawei E5787 (also named Huawei Mobile WiFi Touch). And now the market proves the Huawei E5787 also becomes the best seller of Huawei LTE hotspot with a touchscreen. 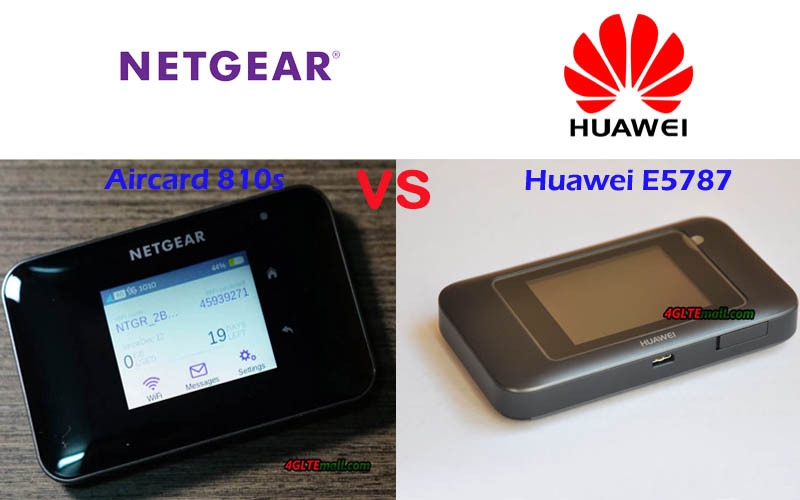 Someone may ask: What’s the difference between Huawei E5787 and Netgear Aircard 810s? Which one is better? You will find one answer in this article. The Huawei E5787 and Netgear Aircard 810s both have a touchscreen in the middle of the front. Netgear aircard 810 has a Home button and Back button at the side of the screen. However, the Huawei E5787 doesn’t have the button. Only Huawei logo is below the screen. They have the same features on the appearance: the power button is at the top edge side of the router, on the opposite side, two TS-9 connectors for external antennas are available, and they both have USB 3.0 interface. The difference is the Huawei E5787 antenna connectors located together while the Aircard 810s antenna connectors are located separately, the USB 3.0 interface is in the middle of the two connectors. 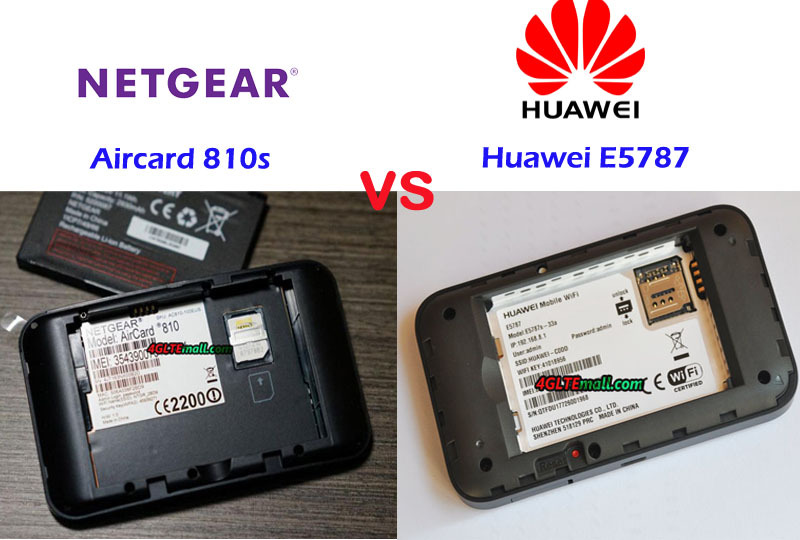 The battery of Netgear AC810s and Huawei E5787 could be removed for exchange, and they both use Micro SIM card. However, they both don’t have the slot for Micro SD storage card. Huawei E5787 has a special design: one corner of the body has a port to tie a rope so that you can hold the rope to keep the Huawei E5787 device. 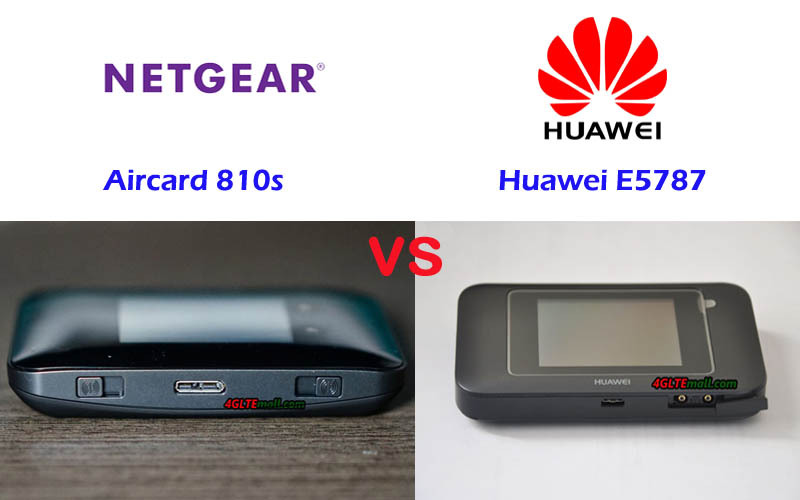 From the specs, we can see the Aircard 810s is more advanced than the Huawei E5787, because the Netgear 810S could support maximum downloads speed up to 600mbps while the E5787 support peak downlink speed to 300Mbps. The Aircard 810s can achieve twice faster speed than that of E5787. It’s probably because of the Qualcomm chipset with more advanced technologies. And Netgear Aircard 810s supports more WiFi users to 15 while Huawei E5787 4G+ supports only 10 users. However, the Huawei E5787 has more variant models, which means the sub-models could work well with more LTE network providers. The unlocked version would travel globally freely. The amazing thing is that the more advanced mobile hotspot Netgear Aircard 810s has a better price than that of Huawei E5787. With more powerful function and better price, if you would buy a 4G pocket WiFi router for global use, the Aircard 810s would be the better option than Huawei E5787.